Not surprised to hear this news come down from the NFL. Every major sports league has been on their soap box hollering that they are going to crack down on any inappropriate behavior on, or off, the playing field – no matter how big of a star they are talking about. Big Ben will be back after a four-game suspension this season. The original ruling was for a six-game ban. However, none of the big-four have truly followed through. 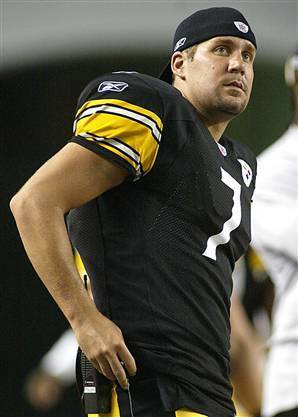 The NFL has cracked down on disciplinary issues big time, Roethlisberger’s suspension is a perfect example. However, reducing the ban is a perfect example of the backtracking that these leagues have practiced as well. The NHL backtracked on an automatic suspension for Pittsburgh’s Evgeni Malkin after he instigated a fight in the final five minutes and lost his uniform against Detroit two years ago. Had his one-game ban stood he would not have recorded three assists in the next game as the Pens went on to win the Cup. I don’t mean to just stand up against Pittsburgh either, totally not my intention. It just so happens that they are the two best examples. The NBA and MLB have gotten better in recent years as they have handed out some serious punishment for guys like Gilbert Arenas and Manny Ramirez. What exactly happened in the bathroom of that bar is only known by Roethlisberger and that girl. Irregardless, the NFL should have stood by their ban. Six games, no more, no less. He violated the personal conduct policy and needed to learn his lesson. This reads more to me like the Steelers are a major TV and merchandise draw and the league doesn’t want to miss out on the action. It doesn’t help the situation that Big Ben has never struck me as a true stand-up guy. At a skills challenge after his rookie year the kid was talking like he just got done failing freshman English at Miami (OH), the cutoff jersey just made matters worse of how he was carrying himself. Then he pulled a Justin Timberlake and decided that acting like he was going into the rap scene wasn’t for him. Either way, the reduction of the suspension doesn’t sit too well with me. The NFL could have saved a lot of drama and just made it a four-game ban in the first place. Then they wouldn’t have backtracked and there would have been no drama involved. We will see if the next suspension handed down will carry a similar stipulation. Of course, that probably depends on who is given the suspension too. I bet a fifth-round guard won’t get the leniency that a franchise QB would.